The Roost was recently visiting by Jennifer Weatherhead Harrington as part of her tour around Grey County. You can read her full write up at this link including some great photos and other ideas for what to include on a visit to Grey County. Thanks Jennifer! The tasting room at @theroostwineco may have only been open for just under a year, but owners Mike and Jess have nailed it with really good wines in a cold climate, a chic country setting and zero pretentiousness when it comes to enjoying a glass or two of crisp whites (you also have to try their sparkling rosè ✨💕✨). The Roost is delighted to have a 5-page feature in Escarpment Magazine this Spring. You can read the full article at this link: Viticulture Meets Vision. Four wines entered - four medals won. The Roost Wine Company is thrilled to announce that our 2016 wines Frontenac Blanc, Marquette, Rose and L’Acadie brought home a gold and three bronze medals respectively, at the prestigious Finger Lakes International Wine Competition held on the 24th and 25th March 2017. The competition has a focus on cold-climate wines and had entrants from 18 countries. Wines were judged blind on their own merits - presence, balance and varietal character - by a panel of international judges. 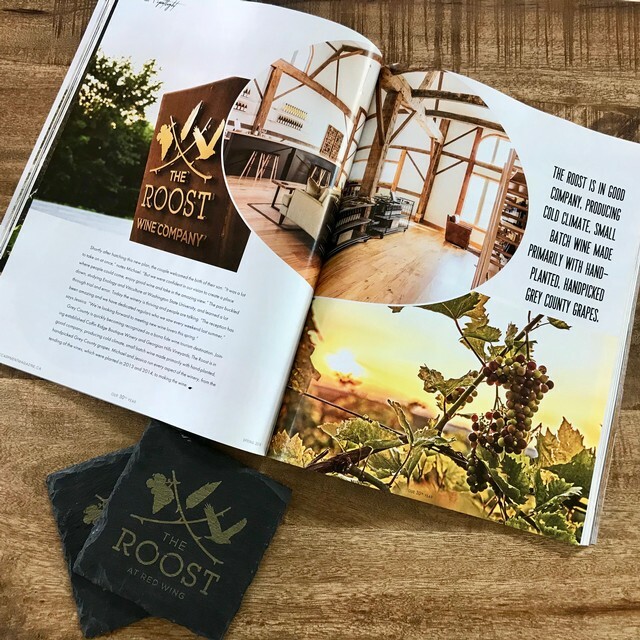 The 2016 vintage was the first produced at The Roost, which opened its tasting room in July 2017. The Gold-winning Frontenac Blanc was the only wine in its category to win the top medal, a notable achievement for a wine exclusively grown and made in the relatively new grape growing region of Southern Georgian Bay. The 2016 Rose is available online and will be back in The Roost tasting room when it re-opens for the summer season in May, alongside the new vintages of Frontenac Blanc, Marquette and L’Acadie. Thanks to The Popped Life for including our 2016 Two Wrongs Make a White as their recommended wine for a Home Office Christmas Party. You can see the review at this link and their Instagram post below. September rolls around bringing bright, sunny days where the temperature hovers around 22C. You track your ripening and find that all the varieties are ripening one after the other with at least three days between harvesting each one. When it does rain, it’s only on Monday, Tuesday or Wednesday and of course, frost never happens. Weekends are dry and warm so that your team of 25 eager, enthusiastic volunteers can join in picking your perfectly ripe, undamaged grapes. Everyone has a great time, and finishes off the day with a superb harvest dinner in the warm evening sunshine on the winery patio. Your grapes are so gorgeous and free of lady bugs that they don’t need to be sorted and can go straight to the de-stemmer and press. You’ve ordered winemaking supplies well ahead of time and are totally organized in the lab and cellar. Everything works beautifully and nothing breaks or malfunctions. The sweet, lovely grape juice ferments perfectly and the entire crush season is over by October 5th. You are happy and relaxed and already booking your December holiday to Mexico. September rolls around bringing a crazy heat wave after a frigid summer. This pushes up the sugar in your grapes but acid doesn’t have time to drop so you end up with very odd sugar and acid levels across the vineyard. Everything is ripening late and rot has been a problem in your mostly organic vineyard due to the torrential downpours you’ve had all summer. You cross your fingers and do a little sun dance, but no one listens. It rains every weekend and there’s frost in the forecast. If you want to pick dry grapes (and you do) you are forced to harvest all your varieties on weekdays when everyone’s working elsewhere and no one can help. Because of the unusual weather, several varieties ripen at the same time, and you spend a couple days working 18 hours a day to get them in before the thunderstorm that everyone’s talking about whips through the vineyard. There are no harvest dinners on the patio. 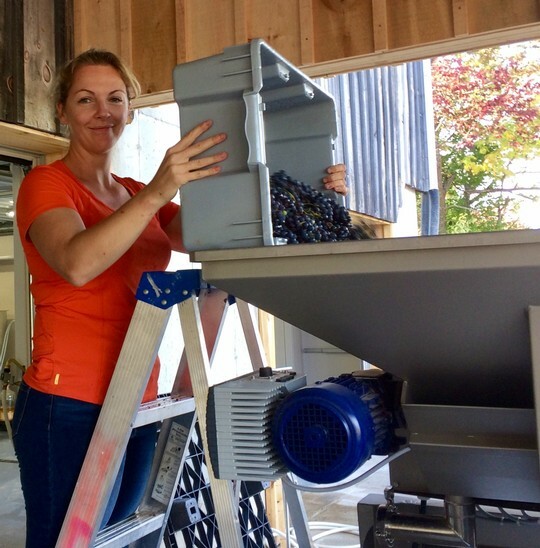 Lady bugs are everywhere and you do not want them in your press because they smell and can ruin a batch of white wine before you can say “Uh oh.” This coupled with the wet summer means that all the grapes need to be hand sorted before you can de-stem and press. This takes a very long time. You find out that when you calculated your yeast requirements after a long day working in the tasting room you forgot about the two tons of grapes you ordered in from the neighbouring farm down the road. This means you don’t have enough yeast and have to drive two hours to get some because you need it right now. Your ferments don’t go perfectly, but you soldier through, often late into the night, and fix the problems as they arise. Then your chiller breaks. Twice. You need your chiller to control fermentation temperatures. Luckily you are diligent and catch it right a way so it’s not a big problem. But it does mean you’re in the cellar more often making sure it doesn't happen again. Crush drags on and the closest you can get to a holiday is a trip to Collingwood to buy a pair of insulated waterproof gloves and some heated socks. But then the first ferments finish. And you can taste the fruits of your labours. And then it doesn’t matter if you can’t get away until January, because you have heated socks. And you made it through another crush. And you know, deep in your winemaking heart: nothing truly great is born without great challenge. This fall we were visiting by travel and food writer Ayngelina Brogan. You can see her review in her excellent article Grey County Fall Colours, and her post from Instagram below. Fall in Ontario is such a glorious time of the year: cool nights, warm days, rich colours and snuggly clothes. Out in the vineyard the furious growth of the summer slows and the plants put all their energy into ripening the gorgeous clusters of grapes they’ve worked so hard to create. For most it’s just a lovely time of year to enjoy slowing down and getting back into a routine. For winemakers it’s the moment we’ve been waiting for. Personally I lose some sleep in the weeks coming into crush (wine-speak for the time of the year when grapes are harvested and wine is made) due to a slight simmering sense of panic that develops right alongside the grapes in our vineyard. The planning, prepping, and of course, the feeling that the entire success of the following year rests on what we can create in six short weeks this year. Leading up to crush at The Roost we’re tracking ripening in the vineyard. This means we’re out picking berry samples every few days or so and testing them to see where their sugar, acid and pH levels are. We’re also tasting the berries and asking ourselves a lot of questions: are they soft? Is the colour even? What kinds of flavours are developing? What’s the weather forecast? Are the berries rain-swollen? What’s the predation like from raccoons, birds, turkeys, coyotes, my dog? Any rot or damage? If the pressure is high, how long can we leave the clusters before we absolutely have to bring them in? I admit it: I get a bit of an adrenalin rush when I get the numbers I’m looking for from my berry sample – woo hoo it’s go time! But there are other things to consider too. Do we have enough pickers? Is it going to rain? Are we done the cellar prep? And of course, something that we really need is always on back-order! Calling a harvest is nail-biting, sleep-disrupting decision – but it also signals the start of a fantastic in-the-zone, whirlwind of activity and creative flow. We might complain a bit and begrudge the lack of sleep, but the secret is, most of us wouldn’t have it any other way. If you're a fan of these wines, you're not alone. We've been pleasantly surprised by how popular they've been. We wish we had more in the cellar to share, but unfortunately the supply will be out in the next couple weekends. The next public release of L'Acadie and Frontenac Blanc will be May 2nd 2018, so if you can't wait until then, please come in and pick up a few bottles before they're gone! Our Rose is now available at Gibson & Co. The Roost Rose is now available in Collingwood. So if you can't get out to the winery, you can always head over to the fabulous Gibson & Co. for Rose by the glass or bottle. 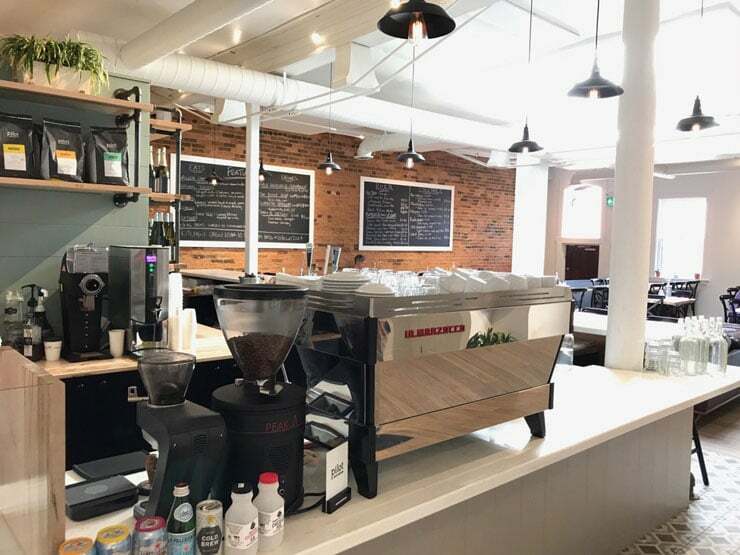 They're at 93 Hurontario Street, Unit 3 and they also serve great coffee, cocktails and wine - of course! THE BLUE MOUNTAINS, Aug. 18, 2017 - The Roost, a new family-run artisanal Ontario winery, has opened its doors to local wine enthusiasts and thirsty tourists. 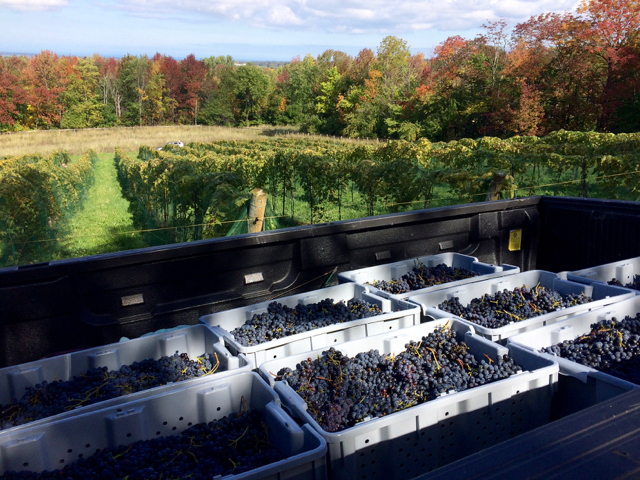 Located on a picturesque hilltop, with stunning views of Georgian Bay and only 20 minutes from Collingwood and Thornbury, the vineyard and winery is the perfect destination for people exploring the natural beauty of The Blue Mountains. The winery is the fulfillment of a dream for husband-and-wife team Michael and Jessica Maish. Together the pair do everything from tending the vines to making the wine. Visitors to The Roost winery can sample six delicious wines in a rustic 19th century barn. Wine fans can also grab a spot on the patio and enjoy a glass while taking in stunning views. Wines can be purchased by the glass or in flights of four, and visitors can also take home wines by the bottle. 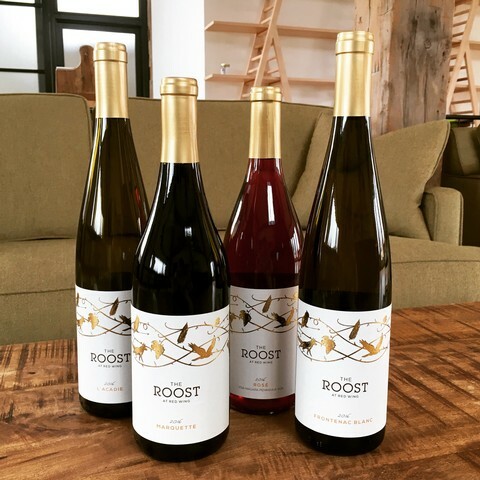 The Roost wines include 3 whites, 2 reds and a rosé. From the fruity red Marquette to the dry and fresh white L'Acadie, there is a wine for every palate. Two Wrongs Make A White is a unique blend of Riesling and the winery’s third white, Frontenac Blanc. Barn Red and The Roost Rosé round out the selections.